Ever hear of a mudpuppy? Or a siren? 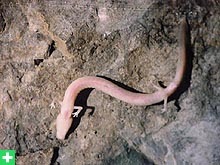 How about an olm, a hellbender , a waterdog or even a amphiuma? No? They are all wonderfully whimsical names for equally wonderful creatures: the amphibians. Amphibians are fascinating creatures, having been here on earth for more the 230 million years. The mudpuppy and waterdog are North American aquatic salamanders. They are stout, elongated creatures that have retained some of their larval features, such as a completely aquatic life style, small underdeveloped limbs and external gills. These protrude out of the gill covers, like reddish feathered plumes. Their canine names stems from the folk legend that they can bark and growl when handled. The siren is not the alluring seamaiden of myth, but is in fact a beaked, eel like salamander that lives in shallow streams and ditches of Eastern America. Like the mudpuppies and water dogs, it too has kept larval features, it even lacks back legs! 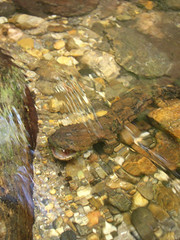 The Hellbender, is a rather impressive salamander. Enormous and wrinkled, some have been recorded as being 2.5 feet long and can live up to 30 years! It is native only to the Appalachian Mountain range of the U.S.A. Even though it is large, this animal breathes entirely through its skin! Hence why its skin is so wrinkled, this aids in creating a larger surface for more oxygen to diffuse across. It also means it needs clear, swift flowing rivers to survive in. The amphiuma is a peculiar salamander, with its glossy eel like body and puny, useless limbs, it has been mistaken for a fish or an eel. It dwells totally in water though it has lungs like many other amphibians. Oddly the larva of this animal have large legs that it uses to walk across moist habitats, they then wither when the animal reaches a water way, where it develops into an adult amphiuma. Lastly is the wondrous olm. Amphibian means ‘double life’, in reference to these animals duel life style, from water to land and back again. The amphibian family contains not only the well known frogs and toads (Anura), but also the Urodela (salamanders, newts) and the astounding Gymnophiona or Ceacillians. There is over 5,400 species found in all habitats (save the oceans and Antarctic). They swim in the darkest caves, leap high in the canopy of rainforests and burrow beneath the soils. And I have been captivated, by their movements, their colours, their modes of life cycle, even their singing! Everything about these animals is never ceasing to wonder me. Glass frogs, Paradox frogs and the rainbow hued Harlequin frogs, the very evolution of their bizarre array of colours is a delightful puzzle for me. I am infatuated. As I watch people follow our amphibian trail about the park, I notice their faces and reactions. There are gasps and exclaims, down turned mouths as they read the unsettling sad facts about what is happening to these amazing creatures. Amphibians have been part of human culture since our history began; they have been revered as Goddesses of Fertility, the rains and of pregnancy. In Egyptian legend, the frog goddess, Heket helps form the infant in the womb. They are good-luck symbols, protectors and in some cases harbingers of plague and assistants to witches. I hope people become smitten with these amazing animals before it’s too late. Unfortunately this reverence has slowly disappeared and amphibians are now vanishing from many habitats, their throaty singing no longer heard and wriggling glossy forms no longer seen. Why is this happening? As of now, our earth is facing the rapid Holocene mass extinct, with animals from all corners of the earth disappearing at an unprecedented rate. Amphibians are being hit the worst. It is only us that can prevent these wonderful creatures from becoming extinct and fading in to folklore and myth forever. Spider monkeys fill an important ecological role in South America. The primates feed on an assortment of fruits and as they travel throughout their environment, they disperse undigested seeds through their manure. These then sprout and replenish the rainforest vegetation.